Lestat speaks. Vampire-hero, enchanter, seducer of mortals. For centuries he has been a courted prince in the dark and flourishing universe of the living dead. Lestat is alone. And suddenly all his vampire rationale–everything he has come to believe and feel safe with–is called into question. In his overwhelming need to destroy his doubts and his loneliness, Lestat embarks on the most dangerous enterprise he has undertaken in all the danger-haunted years of his long existence. It’s been a few years since I read the first three books in the series, so I was a little spotty on who everyone was and all the small details, but found this enjoyable nonetheless. The person who recommended this series to me said that you somehow end up feeling like the world is more beautiful after you read this books. That’s true. 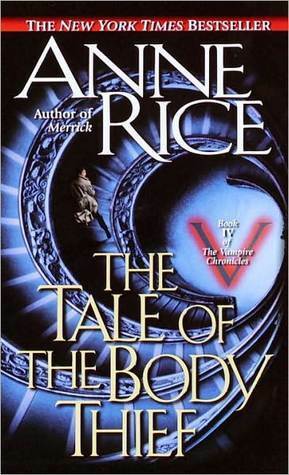 But Anne Rice is also one of those writers who’s too truthful, who describes life too perfectly, to the point where you start feeling uncomfortable, as if this were your life being pried apart and put on display. It’s similar to the feeling you get when you watch you talented actors playing a love scene…like you really shouldn’t be watching this, because you actually do feel like you’re intruding, not being entertained. Anyway, back to the book. I liked that Lestat got a pet (of sorts) in this one. Mojo, the dog, who seems to just inexplicably like him. I like the character of David Talbot and liked that we got to see so much of him as Lestat’s companion and to learn a bit more about the Talamasca. The beginning started off a bit slow, but picked up after seventy pages or so, once the book got into the real meat of the plot. I liked that Lestat got a chance to go back and be human. And I liked how much he hated it. I also really liked how the other vampires seemed to have issues with helping him get his body back. Both because they kind of hate him, and also because he got back the one thing they can’t have: a mortal life, with the ability to love and to grow old and to die. It was an interesting turn on the vampire story. Lestat is really irritating as characters go. And he knows it. And the other characters know it. It’s really a testament to Rice that she can make you keep reading so many of these books where Lestat is the main character because he is serious just so obnoxious and arrogant and sometimes, just plain dumb. He really, really should have expected that the body thief would steal his body. Seriously. If you’re contemplating continuing on with the series, definitely do and don’t skip this one!